I am Brazilian and the saying goes that out of every ten Brazilians, eleven are channels. Of course, this is an old joke, but also is the truth, because for some special reason, most of the channels decided to be born in Brazil. This doesn't mean that there are not channels born all over the world, but in reality it is amazing how we Brazilians are so sensitive inside. I began my spiritual life when I was eighteen years old, and thank god it was in a very special center, founded by the Gasparetto family. There, I studied and worked for fourteen years, where of course I acquired most of what I today know of the spiritual life and the person I am. Of course, I am not writing this article to talk about Brazil and Brazilians, but to talk about the incredible and fantastic country called Peru. I always hear spiritualists referring to Peru as a lost paradise, a Shangri La. It is such a special place that everyone who visits Peru begins to express the times of their life in terms of before and after their visit to Peru. Through Shirley MacLaine's book and movie, Out on a Limb, where she shared her true personal experiences, I was able to comprehend more clearly why people make this stark comparison of their lives in terms of before and after Peru. So, I decided to experience the energy of this magical country for myself with myspiritual group, conducted by my friend -- psychologist, pychic and channel, Luiz A. Gasparetto. 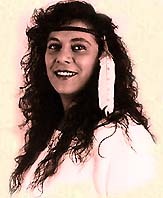 Shirley MacClaine wrote about her experiences with Luiz Gasparetto in Going Within, and in fact devoted chapter 13 of that book to him. We traveled from Brazil to Peru in July of 1989, and I will attempt to describe for you a few of the experiences I had surrounding the special places in Peru. I will also give a brief historical explanation and some information on research conducted there over the past century. 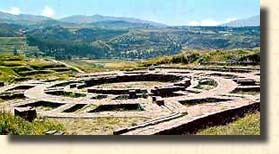 There were seven civilizations or mystical cultures of the Andes beginning with the Chavin who lived there approximately 1000 B.C. These races eventually led to the most advanced people in 1100 A.D. -- what the modern world now calls the Incas. But the word Inca is not the word which describes all of these natives who inhabited the Andes during this period, but was the title for the Leader of the Empire. The Empire was lead by the Inca and the Priests who had to undergo very difficult initation rituals in order to earn this title. Inca Manco Cápac was the founder of the city of Cusco. Cusco according to the Incas, means 'Navel of the Earth' in their native Quechua language. The first place we visited after departing from the capital city of Lima, was Cusco, the former capital of the Inca Empire. Comparing Cusco with Rome, many believe the former was ahead, that its inhabitants did not know how to write as the Romans did, but nevertheless they were much more skillful in the sciences and use of weapons than the latter. They differed, however, from the Romans in that they were unable to leave their exploits in writing; nonetheless they perpetuated their culture with a monument and their creation: which is Cusco. It was in Sacsayhuaman that we had our first impact. The incredible Sacsayhuaman is situated five miles north of Cusco. This perfectly polished stone construction, consisting of three tiers of massive rock in the shape of a serpent which winds for 600 meters reflects the power and majesty of the Inca Empire. The amazing thing about this construction, as well as other Inca temples, is that they were constructed so perfectly that even with earth tremors, which have shaken this country for centuries since their original construction, these temples remain. The legends of how Sacsayhuaman was constructed say that it would have taken 75 years to build and 10,000 to 30,000 men to simultaneously move these stones to this place. The largest stone is estimated to weigh over 160 tons. Similar to the legends and beliefs as to how the pyramids were constructed, researchers have deduced that these people, before the discovery of the wheel, must have had assistance from some other more advanced race (or possibly our space brothers and sisters). The other amazing aspect of this temple is that at its highest point (Cusco being an elevation of 12,000 feet), fossils of seashells have been discovered imbedded in the rock. Muiuparka In the heart of Sacsayhuaman you reach a special energy vortex, Muiuparka, where the Incas performed special rituals to create a connection with the cosmic energy. The innermost circle of the construction represents the Sun, the second, the moon, and the third, the constellations. And wherever you travel in Peru you will always find special temples dedicated to the sun, the masculine energy of yang, and the temples of the moon, the feminine energy of yin. This civilization refers to itself as Sons of the Sun because to them the Sun (Inti in Quechua) was the maximum representation of the divine light and life -- God. Their life was based in harmony with nature and they therefore embraced God (Inti) in all of his divine creation through all of their rituals. Their pantheistical rituals utilized divine expression which enabled them to feel a connection in perfect union of the creator. In the center of the circle we performed a chakra balancing ritual. Feeling full of energy, balanced and ready for our next experience, we moved on to Tambomachay, the Temple of the Sacred Waters, and I experienced an altered state where I returned to the past when we performed our purification ritual as the former Incas, Priests and Virgins of the Sun had performed. Virgins of the Sun were special women of this culture who either devoted their lives to the spiritual quest or were devoted only to the Inca himself for child-bearing purposes.